RSR 555 wrote: There was lots on Subaru's sold during the 80s due the the 4x4 tax free sales but today there is more Subaru's sold than ever before. Bit hard to tell as there is a lot more range available. hey check this FPV video out. "THE BRUMBY ! , Your not taking the Brumby I just dry cleaned the mud flaps." revmax wrote: hey check this FPV video out. All I can say is read the first 2 comments!! hahah seen that one, my guys once he was in he commited to it! The 4x4: 2004 Nissan Navara d22 ZD30 dual cab. I found this video of a RC truck 2000 hours to hand make all made from scratch on kit amazing. yarney wrote: I found this video of a RC truck 2000 hours to hand make all made from scratch on kit amazing. Location: Back in Perth and SORing it atm. Who organised that and was it out the back of Gingin? go the little blue brumby! d_generate wrote: Who organised that and was it out the back of Gingin? It was the Subaru club on someones farm out near Wickapin. They used to go out to the old gingin airstrip, but that was closed to the general public and I think it was leased to a 4wd club. I've seen pics of them before but never knew about the drop down seats and rear opening for long loads, makes me want one even more now. Import duties are the killer, it would great if some one shipped 50 or so at once but I bet they would have trouble breaking even on sales. the other option is to buy a hail damaged or engine damaged outback and build one from scratch. my02 Gen3 Liberty limited ed. 2000 gen3 outback, lifted, otherwise stock. Id like to import one, and use a busted Outback to RHD convert it. 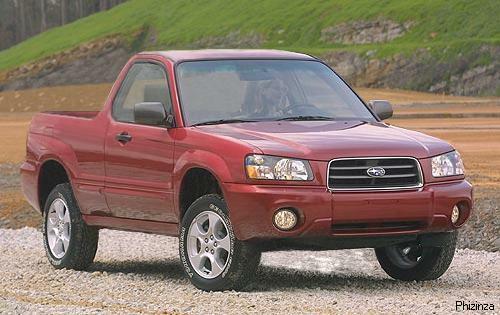 Wish they had a 2 door version of the Baja. Like a newer brumby. I think this photo shop of a Forester looks pretty goood. An XT 2.5 turbo, with 3" strut lift and Subaxtreme front bar would be awesome! Brumby EA81 Oil Pump kit (4 x 'o'rings + gasket) posted Australia wide $22! "souped up mini" <- an understatement! A foot injury would be possible??????? a rather hard video to watch. great vid taza, looks like the new lift has made a massive improvement, seems like the low range inst low enough for that climb! My favorite vid on YouTube. This is why up has right of way. ********* performance sump and diff guards. Me too. That was an epic fail - as in no spectacular fail of the EJ. But I reckon you can guess when it popped a head gasket! What they should have done for possibly a rod out the top was hook up the cooling system and just keep it on the rev limiter until it pops... It'd probably take ages though. Now I'm getting itch feet. Anyone want to donate me an EE20 turbo diesel?? Well this is a water crossing. Over the bonnet is liveable but when you can't see out the damn windscreen I'd be worried! Good thing for the old Lux!! taza wrote: Well this is a water crossing. Over the bonnet is liveable but when you can't see out the damn windscreen I'd be worried! Good thing for the old Lux!! Holy crap! That was intense, I'd be wearing the brown trousers after the water was half way up the windscreen...a little bit irresponsible perhaps to even attempt it, if the car had lifted off the ground he'd need a rescue. Right at the end, understatement of the year: "Well that was scary"
Umm... Yeah - seriously, I didn't know that was possible! El_Freddo wrote: Umm... Yeah - seriously, I didn't know that was possible! Check this mod out! Almost makes me want to buy an Outback just to put a tablet in the dash! Awesome vid as always from these guys. 95Liberty wrote: see this tractor move! I'm sure I heard one of the guys say "put in in Q..."
A great, honest clip. Classic with a great tune too. also love the engine sounds! That is fairly unintelligent, can only hope the engine blew to teach em a lesson. Was that a diesel Hilux? Looks like a diesel runaway, where the engine starts burning the engine oil and you can't shut it down? man i love the gen1 liberty's! Great video Where abouts is this? Looks like the Murchison Off-road Adventure Park. North of Geraldton, about 50km from Kalbarri. Normally pretty tough on cars. 50 km from the highway or 140km from kalbarri. A lifted Subaru could do most of the tracks, but not some of the mud pits or the most extreme hill climbs that are geared towards comp trucks. There where some unlifted outbacks and Forrsters which went ok considering how rough the tracks were , apart from occasionally scraping the bumpers. My car with a 3 inch lift did most of it very well, but there were a couple of places I didn't go. It was a great weekend and I would highly recommend it for four wheel drive enthusiast. So When are we doing something like this!!!! Didnt know how to post the vid, so here it is on a FB page...The greatest Subaru video ever made! NachaLuva wrote: Didnt know how to post the vid, so here it is on a FB page...The greatest Subaru video ever made! that link doesn't work and i don't have a facebook account to log into to see if that works either. It just worked for me so maybe you need to be on FB for it to work. Its a blue RC WRX drifting, racing a "stick bomb"...superbly done! OK found it...the greatest Subaru video of all time! "The economy car for todays economy"
Who says cats aren't loyal??? Wow Suba-cat to the rescue!! One tough cat!! Proton mouse wrote: Wow Suba-cat to the rescue!! One tough cat!! I'm not a cat lover but I like that one.. The Mighty Car Mods guys are doing a very interesting project at the moment, an 11 second Liberty wagon! Fitting a brand new EZ36 engine and custom piping in a big arse turbo. Here's part one, they've made a new video every day this week which is a huge effort, they usually put one vid out every month. That is GOLD! How pissed does that guy get - he really shows it with the car that toots its horn to let him know it's coming! Might have to post this on the 4wd track Australia, Victoria facebook page Or have you already done this Nachaluva?? For those of us interested in a bit of Subaru history, or those who just want to see some MY's with twin carb race engines in action in their prime I Stumbled upon this relatively recent upload on the tube, some 20+ minute long documentary style episode from the 1983 Safari rally, following the team(s) representing our favorite car manufacturer. Alas it is all in Japanese, you can get atuo-generated subtitles but good luck making sense of what it spits out. I couldn't work out what place the Subaru's came but by the end there are some guys standing on the bonnet of an RX coupe spraying champagne everywhere from the podium. If you watch it through you will catch glimpses of the fabled Safari EA81S with twin down draught (Webers?) and the men who raced them. Plus something I didn't know; someone was actually crazy enough to race the wagon body style It's worth the 20+ minute sit down just to hear the old engines screaming around an African rally circuit. Excellent find SB. Loved it!! Some research shows the Subaru nearest to the top came 5th. Not bad for a privately run campaign going up against Audi quattro's and the like. Have you ever come across this one in your YouTube travels SB? My 82 Touring wagon doesn't have the headlight washers, electric mirrors, joystick fader for the stereo and the instrument cluster is different (of course no leather either). Anyone know what sort of rims these are, may be 14's. Love the bloke on the front end trying to bring it back down to earth. I really liked Peter's program as a kid and 40 years on seeing it for the first time again I really like his laid back but sharp style of commentary. His conclusion at the end is interesting: whilst he "can't see the point" of the Subaru 4WD wagon, he talks about a "hybrid" between it and the full-size 4WDs...it was ~14 years before Toyota's RAV4 first appeared and exactly where we are today with the (almost) takeover of the AWD SUV-type vehicles. All 10 1980 episodes of Torque (but sadly no other years) are there for those who wish to trip back to their youth.